Editor’s Note: Thomas Fischer has been working in the financial sector since 1975 and currently serves as the Lead Consultant for ENR Asset Management. For much of his career, he has traveled around the world, teaching investors about global investment strategies—including foreign currency diversification. In the interview below, I sat down with Thomas to discuss some of his recommendations for investing in foreign currency, as well as his observations regarding global markets and foreign currency. Thomas also explains how an independent asset manager like ENR can help you make more informed decisions when it comes to global portfolio diversification. Rich Checkan: I’ve known you for nearly two decades, but you were a seasoned currency trader already when we met. In your opinion, why must every investor pay attention to (and own some) foreign currencies in his/her portfolio? Thomas Fischer: Yes, we have known each other for a long time—time flies when you’re having fun! I have been working in the financial sector for over 40 years, and for 20 of those years, I was actively involved in the interbank foreign exchange market. The daily turnover exceeds $5 trillion a day, so it is a very liquid asset class. I thus believe that all (global) investors should have some currency exposure. If you look at the MSCI World Index, the U.S. dollar weight has dropped from 70% in 1972 to around 50% today. The U.S. is still the single most important market in the world, but the rest of the world is catching up, and investors should have some foreign currency exposure. As an investor, you can choose to have exposure by investing in a stock listed outside the U.S. in a different currency or simply buying a foreign currency. If you invest in a foreign stock, you have stock and currency risk/exposure—whereas buying a currency is a “plain vanilla” currency investment in which you reap rewards from a foreign currency appreciating vis à vis the U.S. dollar. Rich: What impact do you see the current trade wars having on foreign exchange markets? Thomas: First of all, the currency markets dislike any kind of protectionism, and it would lead to much more volatility. All countries would be affected to a certain degree by a trade war, and trade wars are definitely a lose-lose situation for every country involved. Some emerging market currencies would probably fall against the dollar, as it is still perceived to be a safe haven currency. However, an exodus of foreign capital flows to the U.S. would have a very negative effect on the dollar, which would outweigh the safe haven factor. If we look back to 2002, when Bush introduced steel tariffs, the dollar fell 15% over the next few years (although there were also other factors that undermined the dollar). Rich: Do you see the current U.S. dollar strength as being counter to a longer-term dollar decline underway? 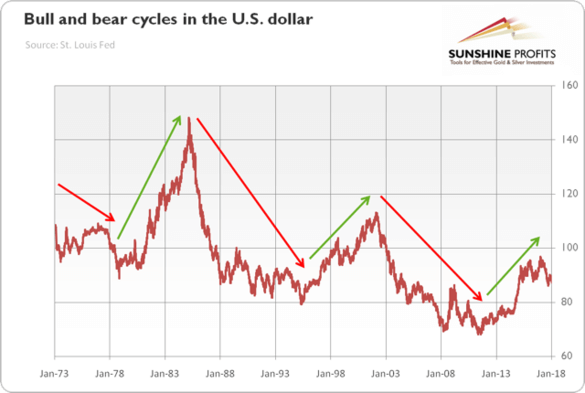 Thomas: Since President Nixon closed the gold window in 1971, the dollar has been in a downtrend, but we have seen plenty of dollar volatility and turbulence with three bull markets and three bear markets from 1971 to 2018. However, as you can see from the chart below, every bull market has lower highs, and every bear market has lower lows, confirming the long-term downtrend. Rich: Is the need to have foreign currency exposure more or less critical than when you started in this business? Why? Thomas: In my opinion, it has always been critical/important to have currency exposure, but the importance has increased dramatically since I started in 1975. Despite the current turmoil and looming trade wars, the world is getting smaller and more interconnected. I believe your investments should reflect this fact and strongly recommend that investors have some currency exposure. Rich: Given the need is more critical today, it seems ironic that currency investing has dropped off from 10 to 15 years ago. Can you comment on the Foreign Account Tax Compliance Act (FATCA) and its impact on investors? On foreign institutions? Thomas: The Foreign Account Tax Compliance Act (FATCA) was introduced in 2010 as part of the Incentives to Restore Employment (HIRE) act. The FATCA legislation was a direct response to the 2009 Union Bank of Switzerland (UBS) offshore scandal that revealed a great number of Americans were maintaining large holdings in secret Swiss bank accounts. The legislation is very comprehensive and complicated, and it requires all foreign financial institutions to identify American clients and report directly to the IRS. If a foreign financial institution is not complying, it is faced with a withholding tax of 30% on all U.S.-sourced payments. Needless to say, many overseas banks simply gave up and threw out their U.S. client base. Just recently, Commerzbank in Germany informed its U.S. clients that they must close their accounts and leave the bank before the end of 2018. As a side note, the U.S. is not complying with FATCA itself, as it has not yet signed the Common Reporting Standard that was introduced by the Organization for Economic Cooperation and Development (OECD) in 2014, which was based on FATCA and the shared objective to fight tax evasion. Rich: How have you and ENR Asset Management adjusted to FATCA in order to continue to offer your services? Why is an independent asset manager more critical now than prior to FATCA? Thomas: As mentioned above, it is becoming more and more complicated for foreign banks to offer direct investment services to U.S. clients. As a consequence, overseas banks will only offer investment accounts if an SEC-registered investment advisor is associated with the account. Today, we offer FATCA-compliant investment services for U.S. clients in Switzerland and Austria. The banks we use act as custodians only, and all investments are directed from the ENR office in Montreal. As an SEC-registered Investment Manager, we instruct the banks what to buy and sell on behalf of our clients. We not only offer managed portfolios where we make all the decisions, but we also provide an advisory service where the client can self-direct their investments (however, orders to the bank must come from ENR). Rich: Many asset management minimums are prohibitively high, and therefore unattainable, for many investors. How is ENR making their services reachable? Thomas: Because of the complex setup, most investment managers have high minimums ranging from $500,000 to $2 million. We have a very close relationship with our foreign banks (visiting twice a year since 1992) and have negotiated competitive banking fees that allow us to offer our services from only $200,000. However, if a client opts for our currency portfolio in which we only invest in foreign currencies, then we can offer this service for as little as $100,000. Rich: Can you briefly comment on the “Currency Sandwich” and explain how this tool can effectively enhance returns for investors? Does it introduce additional risk? Thomas: The “Currency Sandwich” is a foreign exchange portfolio where we invest in a range of foreign currencies. We make ongoing adjustments if market developments change from our overall currency “big picture” view. The portfolio offers great uncorrelated diversification from the equity markets and can be used as a diversification tool. The risk is directly linked to the movements of the dollar, as we only have foreign holdings. I would suggest allocating between 10% to 15% of a client’s total investments in a currency portfolio. Rich: Can interested clients place foreign currencies in their Individual Retirement Accounts (IRAs)? Should they? Why? Thomas: Yes, a client can use currencies as part of their overall IRA investments, and I think it makes sense to diversify investments across different asset classes. The “Currency Sandwich” portfolio is also attractive from a fee point of view, as we mainly use currency accounts (no brokerage fees), and we are long-term investors who make few trades. Rich: Everybody loves a “hot pick” or two. Which do you think are the best currencies for diversification for U.S. dollar-based investors at present? Why? Thomas: Currently, I would choose the Japanese yen (JPY) as my ”hot pick.” Fears of a global trade war and a populist Italian government resistance trigger premiums and demand for safe haven currencies, such as the JPY. The Japanese economy is furthermore operating above potential, causing uncertainty about the sustainability of Japan’s dovish monetary policy. The current USD/JPY rate is around 110 yen to the dollar, and I think we could see a move towards 100 (a 10% appreciation of the yen). When it comes to investing in foreign currency, it’s important to make an informed decision about which currencies you plan to include in your portfolio. Foreign currencies are an excellent way to diversify your wealth outside the U.S. dollar and other common investments, and they can add an extra layer of protection to your portfolio. ASI has dealt in foreign exchange for many years, and we offer over 100 currencies for exchange. To learn more about adding global diversification to your portfolio or to start investing in foreign currencies today, please call us at 800-831-0007 or email us.